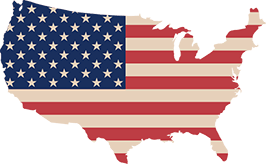 You can always get free iHerb shipping inside the United States for orders over $20 when using the Expedited Shipping method. You don’t need any coupons or special discounts for this. 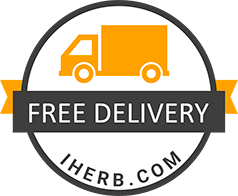 Just go over to your iHerb shopping cart and choose Expedited delivery. If you are a new customer, you can also apply the iHerb coupon code SAS507 to get an extra 5% discount on your order. Internationally iHerb provides free shipping to select countries for orders over $40. In general, the more products you add to your cart, the greater the likelihood that you will receive free shipping. By selecting your destination country in the shopping cart you will see what shipping options are available. Even if the shipping isn’t free for orders over $40, it is typically still discounted. I would suggest experimenting with different product combinations in order to find the best value for your order. A few times a year iHerb provides promo codes and coupons for free shipping. You can check if there is such promotion at this time from the iHerb Discount Codes to Returning and Existing iHerb customers section. Some coupon sites may claim that they have free shipping coupons at all times, but this is simply not true as such constant free international shipping promo codes do not exist. The fourth way to get free iHerb shipping is by making use of iHerb’s new Shipping Saver promotion. 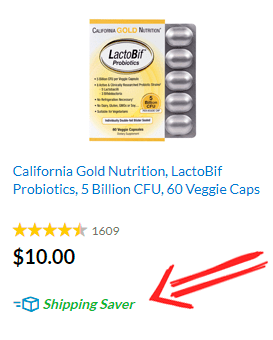 More than 6 000 iHerb products have currently the Shipping Saver tag beside their price. If you add a shipping saver product to your cart, the shipping costs will get reduced. The more shipping saver products you add to your cart the cheaper the delivery will be. Eventually, the delivery price will become free with multiple shipping saver products in your cart. In some countries, iHerb customers may have to pay import taxes or customs fees upon delivery of the order. In many of these countries, the orders are tax-free until a certain value for the order is exceeded. 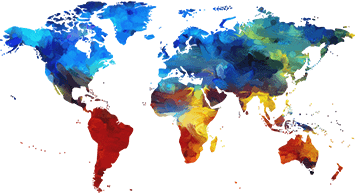 If you are unsure about the possible shipping fees, taxes and restrictions in your destination, select your country and see if iHerb provides you with country-specific information about the delivery. 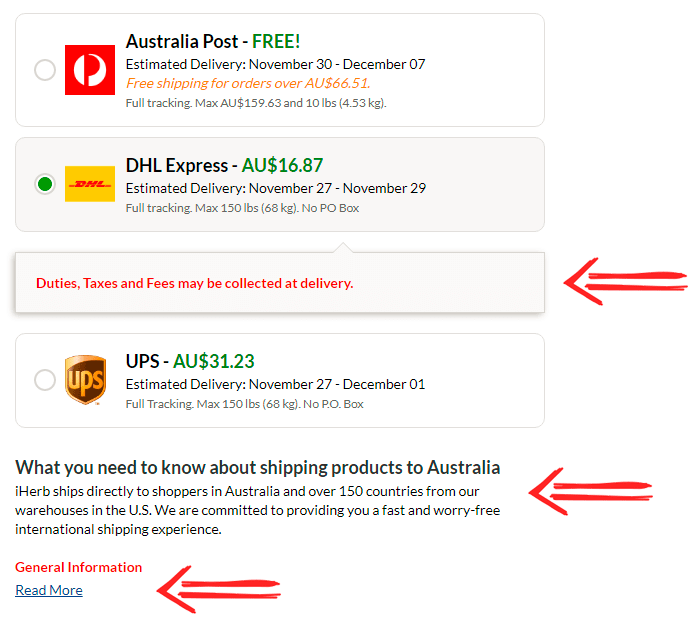 For example, in the picture below iHerb gives very clear and detailed information about delivering orders to Australia when clicking the Read More link. Besides possible import taxes, the second big thing that should be taken into account when ordering internationally is that importing certain supplements is prohibited by law in some countries. This may be because the supplement in question is considered a pharmacy grade medicine or that the product may contain ingredients that are deemed illegal for other reasons. For example, the importing of Adrenal extracts, GABA, DHEA, Lithium, Melatonin, Progesterone, and Yohimbine is prohibited in some countries. Many large coupon sites have free iHerb shipping coupons and other promo codes but often they are expired or the discount information is false. This is not the case with Herb Potato. Herb Potato does one thing and it does it really well. On this website, you will find a daily updated and verified list of all available iHerb promo codes and special promotions. Check out our list of current iHerb promo codes and an extended list of current iHerb discount codes for existing customers. 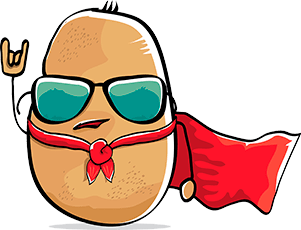 You can also subscribe to Herb Potato’s Discount Watch which is a once a week newsletter with all the coupons and special promotions iHerb is running.